Dear Adolf is a series of six narrative letters based on real letters written by Americans to Adolf Hitler during WWII. Produced in 1942, this is a fascinating collection of vignettes American opinions of Hitler and the Nazi regime. Written by Stephen Vincent Benét, the program was created as "a fight-talk programs" which was network based propaganda shows used to boost popular support of the war. Farmer: "We'll choke you with wheat and corn." Mother: "I do not say it is just or right to hate. I say we hate you for having caused this hate." Businessman: "You can't do business with a man who doesn't know the meaning of a contract." Laborer: "We're sending you a letter 20 million workers long... written in steel and flame"
And an Austrian-Born naturalized American Citizen: "(In America) We don't have to lick the boots of our bosses." 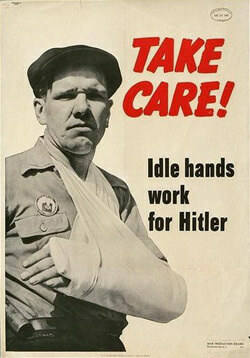 This collection also contains a collection of 180+ WWII-era posters. For more WWII shows, see also:Man Behind the Gun, Hitler Speeches, Soldiers of the Press, Words At War, and You Can't Do Business with Hitler. Be the first to comment on "Dear Adolf"